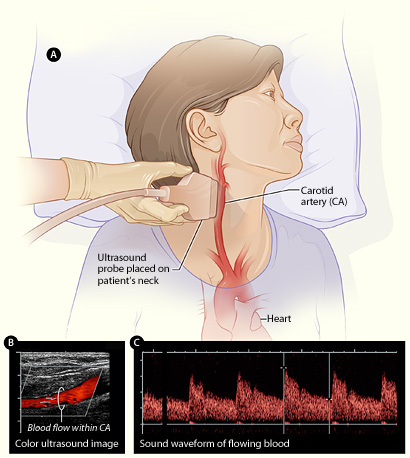 We use carotid ultrasound to detect narrowing of the arteries called stenosis. This happens when fatty substances and cholesterol build up inside the artery walls. The carotid carries blood to the brain, so this can be very serious. A condition called carotid artery occlusion happens when it is completely closed, causing a stroke, the third leading cause of death in the U.S. There are actually two carotid arteries, one on each side of the neck under the curve in the jawbone. Ultrasounds are done when a patient has risk factors such as diabetes, advanced age, elevated cholesterol, or a family history of heart disease or stroke. Besides blood flow disruptions and blockages, they can also find cysts or tumors or congenital malformation. The exam is relatively simple and non-invasive You simply lie down on an examination table and they rub a clear gel over the area of the neck that is over the arteries. A transducer is placed on the patients neck and the unit emits sound waves that are absorbed, reflected, or scattered. The difference in the strength of the signal being emitted by the transducer and the echos received give an image of the movement of blood in the arteries. 4D Doppler ultrasound can show this in real time, making it possible to estimate possible blockages. There are other uses for 4D Doppler besides Carotid ultrasound, please see 4D ultrasound.